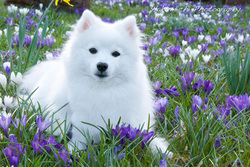 Charney Meko Yuki Tama "Meko"
Charney Meko Yuki Tama (Meko) is our first Japanese Spitz. She came from a breeder down in Oxfordshire (Charney Kennels - Mrs Steph Bliss). From good show lines with many champions in her pedigree. She has a lovely sweet head, great coat and loyal and loving personality. 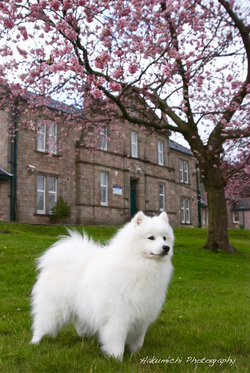 ​A great example of what a Japanese Spitz should be. She was my faithful companion on sailing trips, holidays by car and was shown right up till she was 7 years old. 1 Challenge Certificate and 1 Reserve Challenge Certificate to her name. She is also a qualified Therapet. Having paid many visits to care homes bringing joy to those she visits. Meko had 3 litters passing on her lovely personalities and looks to her puppies.